Those of you who know me may be asking, yes so? What is so special about that. I am a reasonable skier and can ski most runs in a resort – so what is the big deal? Well, in July I was struggling to move my left shoulder. I was in agony and finding it difficult to drive, plus putting on a coat or rucksack was extremely painful. I had struggled all year and it had gradually got worse. I had kept on swimming in the mornings before work because I love it and hoped the pain would go away – it didn’t. By July I was still swimming, but legs only. We had a skiing holiday planned for New Year. We hadn’t been for a couple of years, skiing is an expensive holiday, so we had saved up for it. Skiing is something we love to do as a family. It is simply amazing to stand on top of a mountain breathing in the alpine air and absorbing the view! Then descending carving your way through the glistening snow! It is a physical sport and you need to be fit to really enjoy the experience. With one arm in so much pain I was going to be a liability on the slopes. Although skiing is mainly your legs and core, you need your arms for balance and you need your arms to get you back up again – even the best skiers take a tumble! Plus, the psychology of carrying an injury effects your confidence, which is critical to any adventure sport. In addition, in the past I have had a ski accident returning from one holiday with my leg in plaster which stays in your mind. So, what was I to do? I tried rest, massage, chiropractor, electric shock treatment, steroid injection. Nothing worked. I was struggling to do many daily tasks, plus it was very painful and interfering with sleep. I didn’t know what to do, I kept working through the pain – but should I? Usually, when something hurts you are told to rest it. When I rested it, it ceased up and I lost movement. I paid to see a consultant at the end of September. He told me I must keep on moving my shoulder, despite the pain and that I would need an operation. This would involve 12 weeks recovery and 4 weeks without driving! There was no time for recovery from the operation before my ski trip, so it was down to me. So, I now started to include my arms when swimming, even though it was painful. I used the sauna and yoga breathing to ease my shoulder into greater movement. I set myself a goal – in 3 months I was going to ski down the mountain – I wanted to ski not watch my family from the bottom of the slope. I started working on my lower body, going to the gym using the recumbent bike and doing loads of squatting exercises I also worked on my core. On my first day in the gym, an older gentleman commented on my focus during my exercise in a jokey, fun way. We had a light-hearted conversation and I mentioned I was in the gym for rehabilitation for my shoulder. He too had had a shoulder injury 15 years ago. He shared with me the key exercises the physio had given him. From then on whenever I saw him in the gym there would be a friendly chat or smile – there was someone else rooting for me and encouraging me to keep going, albeit a total stranger, but it encouraged me to keep working through the pain. At the same time, I bought some walking poles. A friend of mine walked with poles. We walked together and I started using the poles on my Forest walks. I used them like ski poles and they gave me confidence for skiing as well as building relevant muscles – I started to visualise myself skiing down the mountain as I walked across the New Forest. It was painful – I focused away from the pain by chanting “I can I will, I can I will” …ski down the mountain. It meant getting up early – 5.00am – to fit everything in around work, but the idea of not being able to ski down the mountain with my family made me get out of bed every day. After a few weeks it became a habit and became easier. We always have a choice on how we view things and then what action we take. Every day from when I saw the consultant to the day I went skiing, I got up early and either went to the gym/swim or to the Forest to walk and work on my ski fitness. By hard work and determination, I had given myself the best chance to be able to embrace the opportunity. I was fitter than I had been for years. Knowing the rest of my body was as fit as it could be gave me the confidence and focus to get on skis. Most important of all I believed in myself, I had done the best I possibly could to give it my best shot. Also, I had surrounded myself with people to help and encourage me. My family are fit, so they encouraged me to workout. Plus, I had the old man at the gym and my friend to walk across the Forest with. So, yes, I skied down the mountain and we had the most amazing holiday! It wasn’t always easy. I had to rein in my adventurous spirit. Stay on piste and avoid jumps. What I hadn’t bargained for was the conditions – somethings are out of our control! There had been no new snow for weeks, I have never skied on as much ice – there were sheets of it – no chance to grip with hire skis. As skiers know on ice you have little control, in fact the best way to get down, is straight down. I was skiing with fit teenagers, who seem to have no fear. Yes, I was pushed totally out of my comfort zone. Full commitment was essential. I committed, said many a choice word under my breath, as I hit patches of hidden ice and ended up on just one ski, or got thrown by rocks or grass coming through the piste. I skied much faster than I had ever skied. The learning however was phenomenal. That week I lived outside my comfort zone and as a result came home a far better skier. Not only that, memories of my old ski accident were erased from my mind. There were a few frustrating moments, when it seemed to take an age for me to get back on my feet. I had gone down facing the wrong way and so had to turn myself over to be able to use my good arm to get back up again. I also went careering 300 metres down the mountain headfirst at one point when the ice got the better of me! Alas I didn’t allow the conditions, injury, or past accidents enter my mindset. 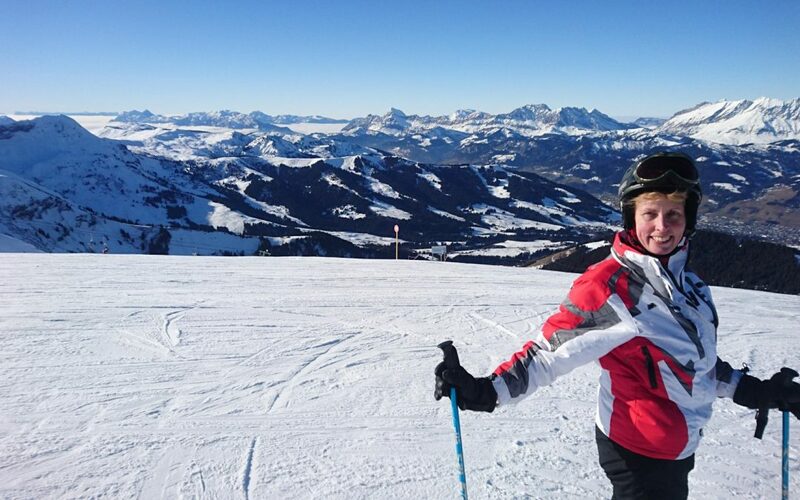 We had so much fun creating family memories – and the benefit of skiing with teenagers – it is captured on the GoPro – so we really can learn from our mistakes! To celebrate we spent an afternoon at the natural hot spring spa, resting our aching muscles and chatting over the week’s escapades, all with the amazing view of Mont Blanc. Nature is such an inspiration. So, we are back now, the alpine air replaced with grey days, yet the memories are strong. Which is good, because I am now facing a new challenge. The operation on my shoulder. It will be a whole new experience for me. Being unable to drive and having to depend upon others for 4 weeks then a further couple of months recovery. I’m sure I will learn a lot! And that really is what life is about. Learning and sharing. If things don’t quite go to plan, we need to decide whether we get back up, learn from it and try again, or stay down. What ever happens to us, at any time, whether it be in our professional or personal life we always have a choice on how we deal with things. We can choose to be a victim, or we can decide to get back up and carry on. It is not always easy. To get back up we have to have belief in ourselves. We have to have a reason for getting back up – a goal. We also need to make sure we surround ourselves with the right people to help us achieve our goal. We can all achieve whatever we want to, provided the environment is right, we have a focus, are prepared to put in the hard work and commit to taking action. We always have a choice over the outcome, we decide our future and the path we take through life. At Baobab Growth we can support you in making the right choices for you. For more information email us on info@baobabgrowth.com or call 07833176481.